Clara's not actually dead, but that should surprise no one. She wakes up hanging upside down outside the Dalek city with Missy, who explains that they were able to escape by using the energy emitted from the Daleks' weapons to teleport themselves away through the use of vortex manipulators which they had also used to find the Doctor previously. But what this also causes is that the devices are destroyed in the process. The Doctor forces Davros out of his wheelchair to use in to break into the room containing the Supreme Dalek is. The wheelchair generates a force-field that protects the Doctor from the Daleks firing at him. He tries to force the Daleks to return Clara to him but they still believe Clarak is dead. Sarff sneaks up on the Doctor and knocks the Doctor out. Missy and Clara have snuck back into the city through a Dalek sewer where defective and broken down Dalek mutants are sent as they are no longer of use. Missy tricks Clara into triggering an alarm before handcuffing her to a wall to bait a Dalek. Missy then injures that Dalek so the mutant Daleks will attack it for being abandoned. Once it is destroyed, Missy tells Clara to get into the Dalek casing so they can sneak back into the main area of the city. When Clara is hooked up to the Dalek system, any declaration of her name will translate outwardly as "I am a Dalek," and any emotional sentiment will translate as "Exterminate." The Doctor wakes in the infirmary where Davros informs him that the life-support cables surrounding them are connected to every Dalek on Skaro and it is their combined life-force that keeps Davros alive. Davros tries to goad the Doctor into destroying every Dalek by way of the cables but the Doctor won't do it. The Doctor shares how he willingly came to see Davros due to the compassion he felt for his sickness. The Doctor shares how Gallifrey was not actually destroyed and Davros congratulates him on this before seeking moral advice on whether or not he was right to create the Daleks. But it's not long before Davros' health begins to further wither. He shares how he wants to the the sun rise once more so the Doctor tries to rewire the life-support system to allow this, but it isn't enough. The Doctor releases a small bit of Time Lord regeneration power into the cables to help restore Davros' health but the Doctor finds himself trapped in Davros' scheme to get this Time Lord energy into every Dalek on Skaro. As each Dalek grows more powerful, Missy becomes alarmed while Clara is left confused and still trapped inside the Dalek system. Hybrid creatures are created from the Daleks combined with the Time Lord energy. This was something that had been referenced in Gallifreyan mythology and Davros believes that this is the true reason that the Doctor had ran from Gallifrey. Meanwhile, Missy breaks into the room to save the Doctor and kills Sarff to do it. The Doctor, now free from the system, tells Davros that he knew his plan the whole time and this regeneration energy also revitalised the defective Daleks in the sewer, who have now begun breaking through the city's reface and promptly begin attacking the function Daleks as vengeance. Clara in the Dalek casing tries to tell the Doctor that she is trapped inside and Missy tries to trick the Doctor into killing the Dalek in revenge, claiming that it killed Clara. All the statements are translating into "I am a Dalek" but when Clara pleads for mercy, the Doctor says that "mercy" is not a word that should be in Dalek vocabulary so he tells the Dalek to think "open" and the casing will open. Clara does this and the Doctor frees her. While pondering how it was that the Dalek had a concept of mercy, he order Missy to run. She does so and once she is cornered by some Daleks, she declares that she's just had "a very clever idea." The Doctor summons the TARDIS with his new sonic sunglasses, as the TARDIS had used its Hostile Action Displacement System. The Doctor and Clara watch from a safe distance as the city is destroyed and the Doctor once again tries to determine how the Dalek system was able to ask for mercy. He then realises what he must do and goes back to see young Davros. Using the Dalek gun, he shoots all the hand mines surrounding the young Davros. Davros asks the Doctor which side he is fighting for in the war, and the Doctor tells him that side don't matter, so long as there is always mercy. He then takes Davros home. 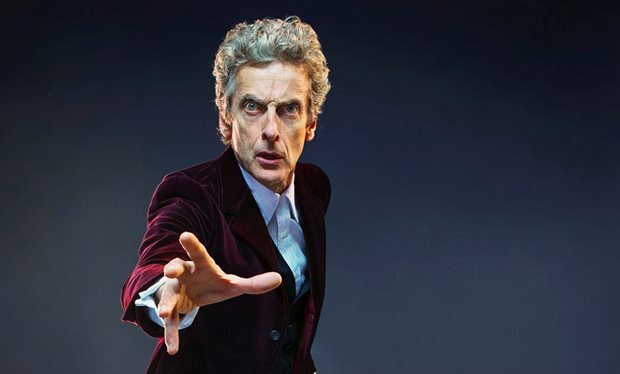 Doctor Who airs on Saturdays on BBC One at 9PM.